Seating arrangement in the performance space or concert hall (seated audience), resulting in the definitive fixing of the four directions (front/back-left/right). Establishing the beginning and end, and thus the total playing time, of the Space-soundComposition with potential dramatic, linearly directed progression of the particular Space-soundComposition. Inclusion of a group of instrumentalists as an element with equal rights to the Space-soundBody which would otherwise consist only of loudspeakers. The concert loudspeaker-instrumental-body, which is formed from loudspeakers and instrumentalists without any hierarchical structure, generally surrounds the auditorium in a circular- or horseshoe-shape. 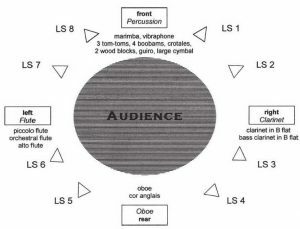 The concert Space-soundBody can be performed once in a concert or there can be several, consecutive performances with the audience admitted at the beginning of each Space-soundComposition. An example is the Space-soundComposition ‘TopoSonic Lines n’Rooms with Instruments’ (from Spring 2002) for a 12-limbed Space-soundBody, experienced in concert form, with 8 loudspeakers and 4 instrumentalists (Percussion, Flute, Clarinet, Oboe). As a commission for the AUDI-Culture Fund, this work has been tuned especially to the architecture of the ‘museum mobile’ in Ingoldstadt, Germany. 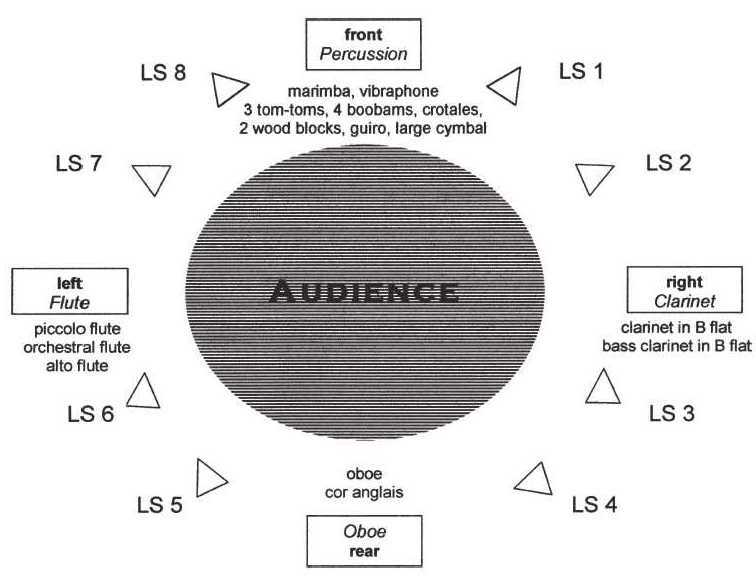 To suit the circular performance space the loudspeakers and the instrumentalists, as shown in figure 10, were grouped around the seated audience. By means of a corresponding instrumentation, the instrumental part of the Space-soundComposition – in the same way as the digital 8-channel tape – takes into account aspects of the space-sound movement, resulting in a jointly ‘acting’ 12-limbed Space-soundBody.